Wellington sites like this one are a delight to discover and work with. The clients had lived in an ex-state house here for many years before deciding their future home needed to be warmer, lighter and more inspiring. With a brief that required natural materials and strong energy efficiency, they added the desire to make their home a sculptural element suspended in the bushscape, to embrace and frame the outstanding views - and a killer kitchen. John Mills Architects were chosen from a short list of architects, for having a warm, contemporary, colourful aesthetic, with subtle detailing, generous use of timbers and a relaxed but evolved feel. The concept design that they embraced was inspired by the aerial dance of the tui that abound on the site perched on the edge of the town belt. 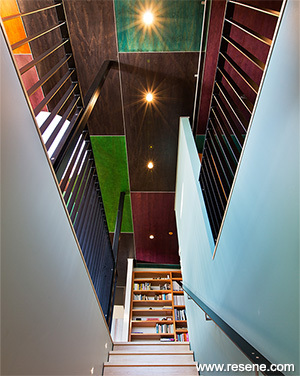 The ceiling, with its expressionistic composition of six different colour stained ply panels using Resene Colorwood in custom mixed colours, represents the blurred flash of deep incandescent colour one experiences as a tui dives past you in full flight. This sense of colours was framed by the subtle use of colour on the walls. A deepest off white of Resene SpaceCote Low Sheen in Resene Black White (grey white) absorbs some of the vast amount of light flowing in from the floor to ceiling windows. This combined with some cool soft blues and green of Resene Gulf Stream (watery blue), Resene Fountain Blue (water blue) and Resene Green Smoke (yellow green), balances the strong ceiling palette and the extensive use of timber finishes that were desired by the owners. From the untreated flooring, other timber and decking, to the solar water heating and wool insulation, the clients embraced the chance to make an enduring and evocative home. They were keen to explore how open their living level could be. Contrasting with this notion are the cosy window boxes to perch in while reading in the afternoon sun. Downstairs provides accommodation for the frequent guests that come for a few days and end up staying for weeks captured by the peaceful, inspiring and sunny location. Without the obligatory garage, this beautifully finished home is at one with the bush. Warm, light and expressive, part nature, part colour spaceship, lying over the bush. 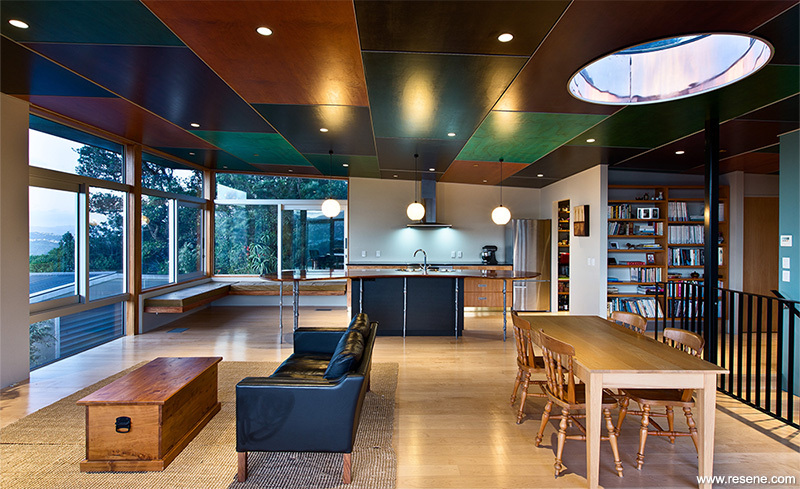 Recreating the flight of the tui in colour blocked ceiling panels, this Tui Home by John Mills Architects was awarded the Resene Total Colour Residential Colour Maestro Interior Award. The judges thought that “inspired by the tuis that inhabit the surrounding bushscape, the commitment to capturing the colour of nature and bringing it indoors in such a unique way has created an awe-inspiring project. Combining the various colours shows very close attention to detail to ensure each complements all others. Ceilings are often neglected yet this sense of colour is spectacular on the ceiling and simply framed by the subtle use of colour on the walls. Without the colour you would never give the ceiling a second glance. With it, the ceiling is an art form on its own.